a pilgrimage devoted to reclaiming the full nature of Mary: the primordial force of creation in Christian Mythology as The Black Madonna. Long, too long, has the image of the Feminine been repressed in the spiritual and religious culture of the West. The images of Mary have been boxed, imprisoned into a chaste, untouched and ‘heavenly’ lady, who is cut off from the rawness of the soil and the fiery qualities of life. To reclaim the full feminine and the true heritage of Mary, we can turn towards the Black Madonna, where the fragrance of the primordial face of the feminine is present. 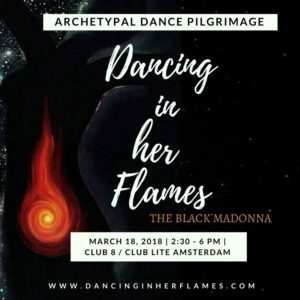 The Black Madonna is a force of creation that has some similar qualities to the Hindu Goddess Kali, but she is more whole and complete – and actually very important for the Western woman as she is part of our heritage. Some important feminine scholars say the Black Madonna dates back to Isis and is actually the Western heritage of the Great Mother archetype. Others say that she was brought into the West from the (middle) East by the troubadours. In any way, the image of the Black Madonna provokes a lot of her true nature; Mystery. In the Black Madonna we can find the missing link of how the Wisdom and myth of Sophia can become embodied on Earth. Black Madonna is the earth, the soil, the cells and tissues of the body. She is movement, fire, dance and the Goddess of true transfiguration by fire. She can teach us the art of surrender, and how to dance our way through true transformation, into the fires of destruction for the sake of a complete re-birth of a New Feminine consciousness. Come and journey with us through our 4th Archetypal Journey through the Wisdom of the Sacred Feminine if you feel Her call. We will start with Dreamwork, followed by embodied ritual, storytelling and Dance! You do not need to have done any of the previous journeys with us to join, as each journey is one of its own, spiralling and weaving into the next and the previous taking all who join in the flow of the rivers.